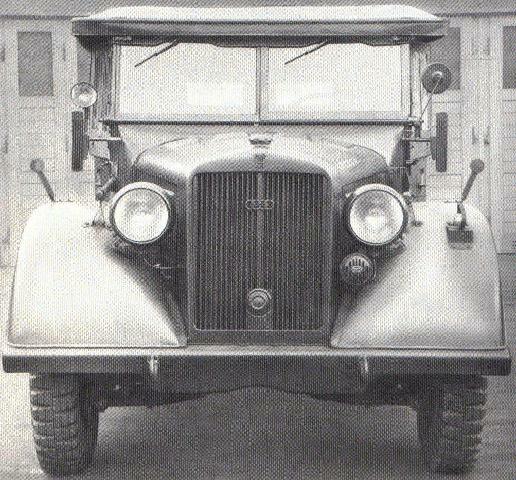 The Kfz15 is a prewar German specification for medium passenger cars. Horch is one of the manufacturers of that class of vehicles, along with Opel. The Horch car was used extensively in the early part of the war. It will be in gray in Europe and Russia through 1942, desert yellow in North Africa, and maybe a few will have been repainted in dark yellow after 1943. Rommel used one, garanteeing its popularity with modelers. Its successor, the Horch 40 is essentially the same car with a wider body that goes outside the spare tires instead of inside. This is an all resin kit with lots of parts. There is a fair amount of cleaing up to do. Take care when cutting parts off the sprue, resin is very brittle! It is also toxic so people are advised to wear a painter's mask when sandin resin. The dust will clog up your lungs, so I am told, so the hobby will eventually kill more than just time. Kit instructions. Uses pics of the real vehicle for part placement. I recommend getting your own pics, to be on the safe side, as the photocopy is poor quality. Side view. Lots of bubbles to fill on the underside. A quick dimension check shows that the wheelbase is short by a little under 1mm. Closeup of the dash and interior. Nice detail marred by a couple of bubbles. Closed top, for use with side curtains. Open top is also possible.